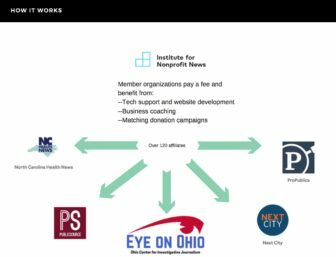 The Ohio Center for Investigative Journalism, or Eye On Ohio, looked at six collections firms that hired lobbyists to represent them before Attorney General Mike DeWine. Over his first six years in office, the average annual receipts of four firms jumped between 61 and 349 percent after hiring a lobbyist. Two firms with no collections contracts before hiring a lobbyist jumped from zero to average payouts of $722,006 and $924,606 per year. Mike DeWine was sworn in as Ohio’s attorney general on a freezing Sunday afternoon in January 2011. But behind the scenes maneuvering for $50 million in annual state collections outsourcing was just heating up. Top collections lawyer Charles “Chuck” Mifsud did well during Cordray’s two years as attorney general, receiving average annual revenue of $1.2 million. He didn’t give a dime to Cordray or the Ohio Democratic Party during that time, though he did have a lobbyist to influence Corday’s policies. And he did attain high marks in a scoring system created under Cordray to rate and choose outside collectors. After DeWine declared his candidacy for attorney general in 2010, Mifsud opened his political wallet. From 2010 through 2017, he and two members of his family gave $150,550, most of it to the Ohio GOP’s state candidate fund, according to state campaign finance records. Only $4,500 went to DeWine’s committee. Another $3,300 went to Pat DeWine’s committee. But Mifsud didn’t stop there.. Two days after Mike DeWine was sworn into office on Jan. 10, 2011, Mifsud hired a lobbyist to represent him at the attorney general’s office. Nowhere else. The lobbyist was David Myhal, who had just served as DeWine’s campaign fundraiser. Payments to Mifsud for collection work began to soar. He reached the $2 million mark in fiscal 2012, $3 million in fiscal 2014, and his annual haul has stayed there ever since. His $17.6 million in revenue makes him the second-highest paid special counsel for collections during the DeWine regime. Mifsud did not return telephone calls for comment. Neither did Myhal. Another DeWine-hired collector who makes big political contributions is Keith Weiner of Cleveland. He, too, has a lobbyist, Joseph Jarabek, hawking Weiner’s services to DeWine. Weiner racked up $1.9 million in state collection payouts in 2017, fourth among all vendors. Since 2010, most of the $151,400 in donations from his law firm have gone to the Ohio Republican Party State Candidate Fund. Another $10,000 went to DeWine’s committee. Money has come not only from Weiner, but from at least seven of his employees. Likewise, Eric Jones and Scott Schiff of Columbus saw their fortunes skyrocket with DeWine. Four months into DeWine’s term, they signed on with a rookie in the lobbying ranks: Michael Kiggin. According to papers filed with Ohio’s Joint Legislative Ethics Committee, Kiggin would only represent them in one place – DeWine’s office. Kiggin knew DeWine well. The pair attended law school 40 years earlier at Ohio Northern University and were the top officers in the Student Bar Association. Whether Kiggin had anything to do with it or not, the collection work started to snowball for Jones and Schiff. In his first six years of collecting state debt for DeWine, Jones made an average of $1.3 million a year, or triple what he had done before. Schiff averaged $653,638 a year, or approximately four times more. Neither Kiggin, Myhal, Jones, Schiff nor Mifsud returned Eye On Ohio’s phone calls. DeWine declined an interview request. His spokesman, Dan Tierney, said the vendors’ representation by lobbyists is nothing out of the ordinary. “Collection vendors or their representatives contact us to discuss the business they do, their capacity to do more work, their ability to work other portfolios, and the process and progress of their contract work,” Tierney said in an e-mail. 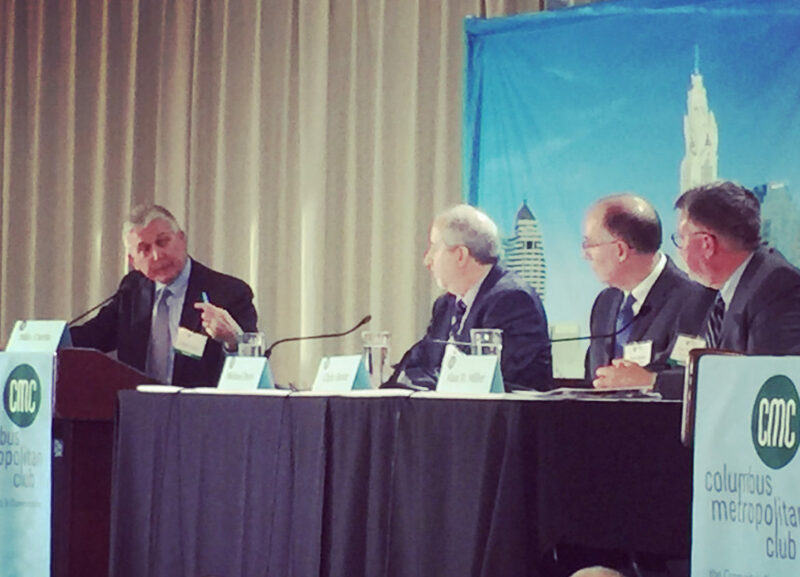 “Our office does not solicit lobbying nor seek to be lobbied,” he said. 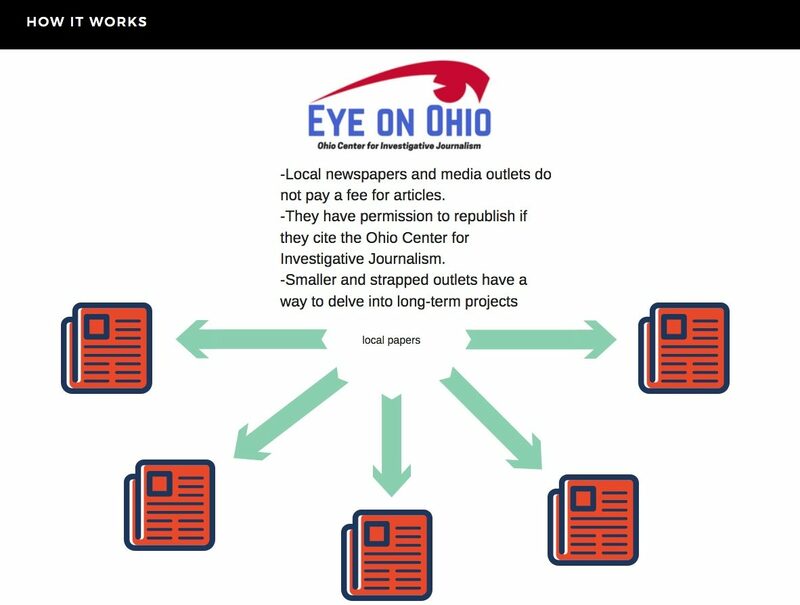 Unlike a majority of states, the amount that companies pay to lobbyists in Ohio is not a public record. But at least one lobbyist was paid $10,000 a month, according to an ex-associate. Former Eric Jones contract worker Steve Slyh said hiring a lobbyist was an essential step in getting more work from Attorney General Mike DeWine. He said that Jones paid lobbyist Michael Kiggin $10,000 a month. Steve Slyh, pictured in 2018. Photo credit James McNair. Slyh said Jones hired him to oversee his firm’s entire collections department and to ratchet up revenue. On occasion, he said, he was in Jones’ office during telephone calls with Kiggin, giving him a keen understanding of the importance of both lobbying and making political contributions. At other times, he said, DeWine was on the other end of the call. Among DeWine’s outside debt collectors, Jones is the 10th biggest political contributor to Ohio recipients, counting money from his wife and four employees. From 2010 through 2017, together they gave $145,647 to the Ohio Republican Party, Mike DeWine and his son, Ohio Supreme Court Justice Pat DeWine, according to state campaign finance records. Slyh and Jones parted ways in December. After a personal spat with another attorney in the office, Slyh said he was denied access to his office and belongings in Jones’ law firm. In January, he filed suit for breach of contract, seeking more than $25,000 in unpaid compensation. Jones’ lawyers say the claims have no merit and are asking that they be dismissed. The case is pending in Franklin County Court of Common Pleas. Companies will spend substantially more money on lobbyists than on campaign contributions to get what they want from states, said Ed Bender, executive director of the National Institute on Money in State Politics, a nonpartisan nonprofit that tracks political spending. Craig Holman, an expert on lobbying and campaign finance at Public Citizen, a nonprofit left-leaning government watchdog group in Washington, D.C., said companies expect – and often get – a “handsome rate of return” on their lobbying fees. As a lobbyist for collection firms, coincidentally Kiggin offers first-hand experience as a late-payer. Two years before Kiggin became a collectors’ advocate, a Franklin County judge returned a $300,000 civil judgment against him and a company he owns, Muirmont Management Group, for nonpayment of a promissory note. In March 2010, an attorney for the plaintiff, Michael’s Finer Meats, told the court that Kiggin didn’t have the assets to pay the debt. But in August 2011, four months into his new lobbying gig, Kiggin reached an out-of-court settlement with Michael’s for an undisclosed amount. And in 2014, he and Muirmont settled another lawsuit, this time over an alleged 8-year-old $100,000 debt to an Anthony Iacovetta of Columbus. Muirmont did business as a restaurant called Thom’s on Grandview Avenue in Columbus. Although Thom’s closed long ago, Muirmont maintains active standing as an Ohio limited-liability company. And it still owes the state of Ohio more than $45,000 for delinquent sales taxes and workers’ compensation. DeWine’s office collects amounts owed to those two state agencies and is named as their attorney of record in the 10 case files. Those particular debts, Tierney said, were farmed out to six different special counsels, none of them Kiggin lobbying clients. 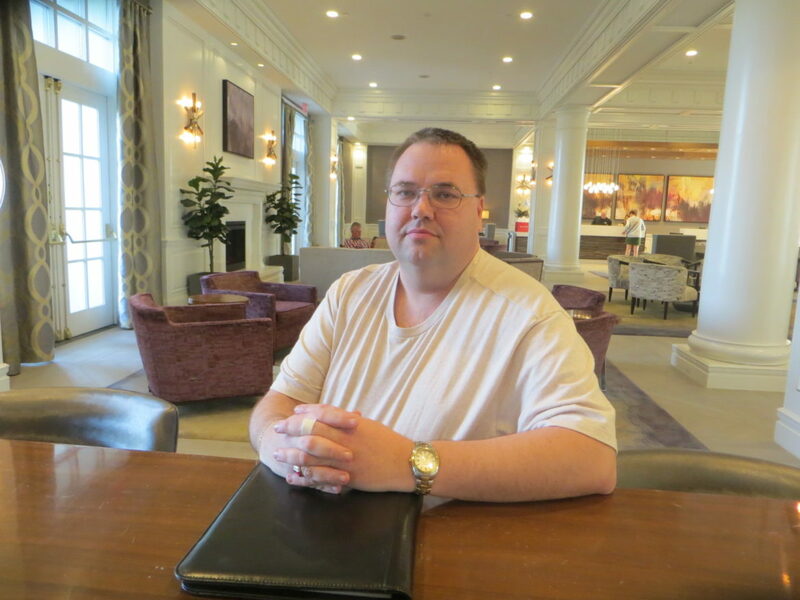 Eric Jones had a run-in of his own with a tax collector – the Internal Revenue Service. In March 2013, while Jones was serving as a special counsel to DeWine, the IRS slapped him with two tax liens, legal claims against property. One was for $93,042 in employee tax withholdings from 2009 and 2011. Another was against Eric and Tara Jones for $30,416 in income tax from 2011. Both liens were released within six months, indicating that the debts were paid. Tierney said the AG’s office does not receive notice of federal tax liens filed against its special counsels. “We would not expect to be notified of a federal tax lien because, unlike federal tax judgments and state tax liens, federal tax liens are not adverse claims,” he said.